V. PAULIUS & ASSOCIATES UAB VPA Logistics - COLD STORAGE facilities to the FOOD INDUSTRY. With a 35 year tradition for innovation and excellence, VPA has extensive experience in providing comprehensive designed COLD STORAGE facilities to the FOOD INDUSTRY. VPA has now established Public Cold Storage Facilities in both the domestic and international markets. 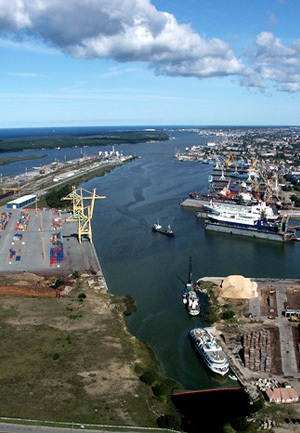 KLAIPEDA, Lithuania is a well established and well known Seaport with excellent facilities located in Eastern Europe and connects to all of Northern Europe with daily service. The presence of VPA in Klaipeda has enabled our company to strategically position itself for International Trade with all of the Baltic States, Russia and the CIS countries. UAB VPA currently owns & operates over 30,000 sq.m. (320,000 sq.ft.) of state of the art cold storage space located within the Port of Klaipeda and Baltic Logistics Center (BLC), adjacent to Klaipeda State Seaport. In addition to cold storage, UAB VPA has 13,200 sq.m. (142,000 sq.ft.) of modern, high-cube, dry storage area. Customs bonded services are also provided directly by UAB VPA. Currently, UAB VPA is expanding its operations by finalizing plans to construct an additional 27,500 sq.m. (296,000 sq.ft.) of industrial storage space and 22,360 sq.m. (240,000 sq.ft.) of Flex Office/Warehouse Condominiums. Along with DESIGN, DEVELOPMENT, CONSTRUCTION and REFRIGERATED SERVICES, UAB VPA offers full GLOBAL LOGISTICS - Transportation, Warehousing and Distribution, as well as Real Estate Property Management. Click here to learn more about UAB VPA Logistics.